Hulu on Friday released the first images of the next season of The Handmaid’s Tale, announcing that the next season will be released in April. Unfortunately, they weren’t any more specific than that. Another lingering question is whether or not Hulu will continue on with its weekly release of episodes for Season 2. In the first season, Hulu released the first three episodes at once, with the rest coming once a week after that. The series, which originally premiered around the same time last year, has taken home the Emmy, Golden Globe and Critics’ Choice Award for Best Drama during this year’s awards season. Alexis Bledel, who originally played Ofglen, has also been promoted to a series regular for the second season. The Handmaid’s Tale is a key piece of Hulu’s strategy. The first season was released in conjunction with Hulu’s Live TV service. And given that The Handmaid’s Tale has become a must-see show, the company now has a more convincing play when asking users to upgrade to the $40/month Live TV offering. The first image released shows a large group of people traversing a wide open field. There seem to be two different ‘classes’ of people in the image, one being herded and the other doing the herding. While the group being led seems to have similar outfits to the Marthas, the group doing the leading don’t have familiar uniforms on. Might this be our first look at the Colonies? The second picture is of the series star Elisabeth Moss, who plays Offred, covered in blood. She doesn’t seem to be bleeding herself, so maybe Offred ups the ante this upcoming season. 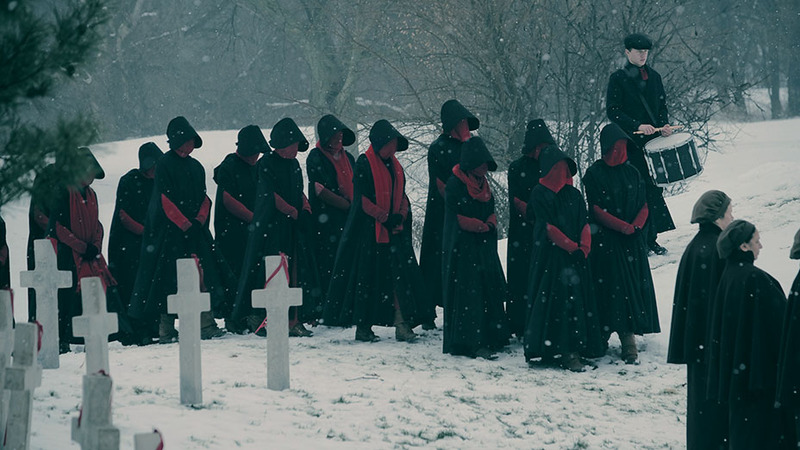 There’s also an image, first released to Entertainment Weekly, that shows what appears to be the Aunts and the Handmaids walking through a cemetery. They’re all wearing black. Unfortunately, we’ll have to wait until sometime in April to get to the bottom of this.